Homes in a Cornish village are being given state-of-the-art heating as part of an environmental project by a housing association. 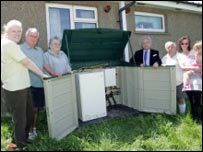 Penwith Housing Association is installing ground source heat pumps in nine homes in Trewellard. The pumps use an underground loop which transfers heat from the ground into a building to provide space heating. The heat pumps reduce running costs for home owners and have a low environmental impact. One of the residents already using the pump, Mike Smith, said he was now paying the equivalent of what he paid for one room before. Cornwall Sustainable Energy Partnership contributed towards the cost. A spokesman for Penwith Housing Association said the pumps would help meet targets in Cornwall's 2006-2009 Local Area Agreement, the achievement of which would lead to further funding of £1m.